Community economic development (CED) is about finding economic opportunity from the skills and interests of individuals within a community who then leverage the assets of that community. It is fundamentally bottom up, and most often explicitly used as a strategy in physical places that have been ignored or abandoned by the mainstream economy of an area. The solutions found are collective in nature, inclusive and usually incremental and solid. This paper has been inspired by the abandoning of CED for what seems to be an almost cultish obsession with the “leadership of the individual”. 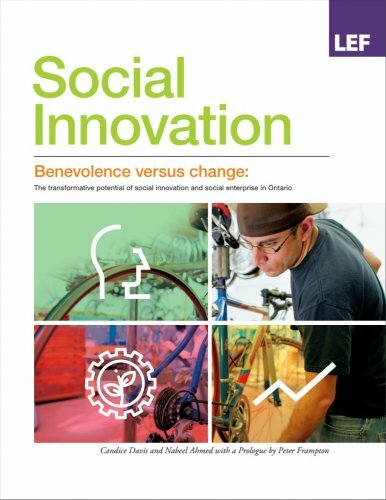 The reframing of “social enterprise” as a business strategy and the utilization of social enterprise as a “work around” for broken systems reposition a powerful tool of community renewal far away from its historical roots. As we examined the increased dialogue around and investment in both social innovation and social enterprise we became alarmed at the extent of the investment disconnected from struggling communities. We also became alarmed at the facts that are being ignored. With 50% of the revenue for the non profit (NP) sector being fee for service, NP organizations are actually a mature component of the economy (larger than the automotive sector) and an engine for growth. Yet no investments are being made to scale up what is already working or provide the supports to ensure sustainability in the social enterprise ecosystem (e.g., capacity building, an enabling policy/regulatory environment, access to capital, and encouraging demand and supply). It is our hope that this paper will trigger some deeper reflection, discussion, and a renewed effort to connect and engage and find the solutions to local issues in local people and assets that have so much wisdom and potential.